We really wanted the use of a pool while we were in Sorrento, but were staying in an Airbnb rather than a hotel. I figured there would probably be some hotels where you could pay to use their pool, so I did a bit of research online. Most of the information came from scattered TripAdvisor posts. Since I couldn’t find one definitive source regarding the use of swimming pools in Sorrento on the Amalfi Coast, I thought I’d compile my research for others. 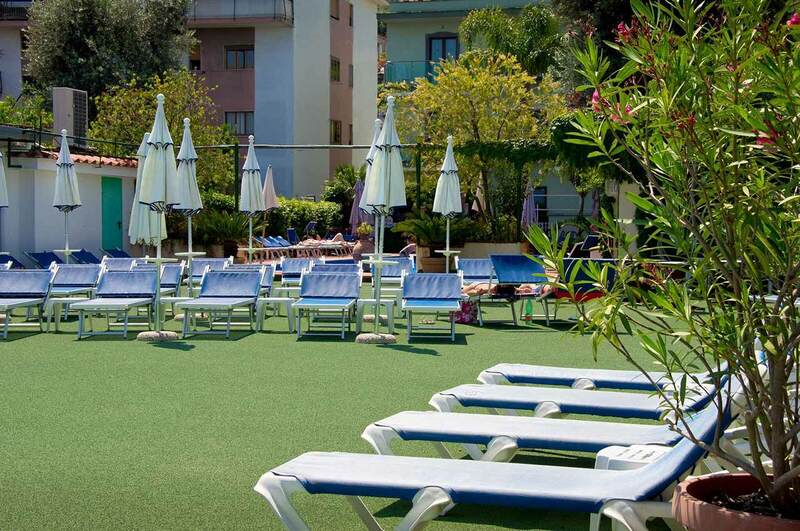 We only had enough time in Sorrento to sample one of the pools, and we ended up going with the one at Hotel Central. It cost €10 each to get in, and was open until 7pm – unfortunately I neglected to check what time it opened, but I suspect it was 9am. Hotel Central had a medium sized pool with a good number of lounges in both shade and sun, with a solarium off to the side. The pool was quite warm when we visited – absolutely lovely temperature. The bar on site has a happy hour, reasonably priced cocktails, and chair service. If we had more time we would have gone back! The entrance is the “Central Fitness Club” just to the right of the front doors to Hotel Central, and to the left of Hotel Gardenia, which has an arrangement with Central so that their guests can use the pool as well. 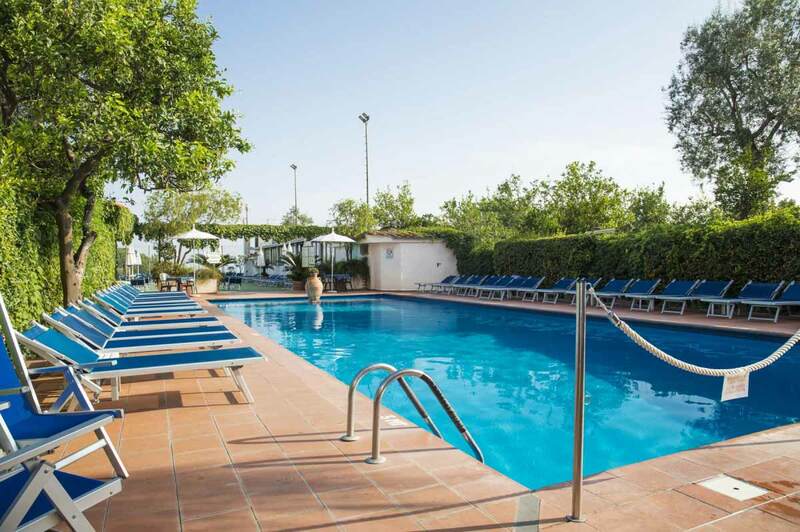 Costs €15 per person, open from 9am to 6pm and use of the pool by non-guests is subject to availability. Also has a bar with a good range of drinks and food available. Costs €15 per person, open from 9am to 6pm and provides you with towels. We didn’t actually get to go in and see what the pool looked like or the facilities, but the Flora certainly looks like an upmarket place so I imagine they at least match the other hotels we checked. The website states it also has a pool bar. I hope this helps other people in our position make the most of their time in Sorrento! Catching the Bus Along the Amalfi Coast, Italy. We had booked four full days in Sorrento with the thought that we would use it as a base to see the Amalfi Coast. Sorrento is not actually on the Amalfi Coast, it sits on the northern side of the peninsula and the AC runs along the south side. On the map below you can see Naples in the north, Mount Vesuvius and Pompeii in the middle and then the route the bus takes from Sorrento to Amalfi. To go from Sorrento all the way to Salerno to see the whole Amalfi Coast takes two buses and about 3.5 hours – you have to change at Amalfi. Amalfi is also where the buses leave to climb up into the hills to reach Ravello. Although it is not far in a straight line from Sorrento to Amalfi or onwards to Salerno, the route is incredibly twisty-turny and the road hugs the cliffs. On our second day in Sorrento we bought the ten euro day pass and caught the 6:30am bus to Amalfi where we stopped for a hearty and not-at-all-Italian breakfast. Then we continued on to Salerno and then back, stopping in Amalfi for lunch. While the first bus was less than half full when we set off at 6:30, it was standing room only before it got to Amalfi and every bus thereafter was full to the absolute limit, often turning away customers. Just being on the buses along the route is an experience. The buses have a very loud and distinctive horn that they blast before all the sharp bends in the (often vain) hope that people will stop in an appropriate place so the bus can make it around the turn without having to stop. Usually people either don’t know what to do or don’t care and come on anyway, which means that they then have to reverse back around a corner. Traffic builds up so quickly that it sometimes takes quite a while for people to make enough space for the bus to move forwards and clear the road. Frequently people have parked along the side of the narrow road, making the bus driver’s job even harder. There are tow-away signs all over but no-one seems to care. People also seem to dump rubbish, either in bags or just in pieces, along the road and it’s kind of infuriating that Italians (and tourists I guess?) don’t seem to respect the unbelievable heritage and natural beauty they’ve been given – and on the other hand, if you’ve been elsewhere in Italy you just have to shrug and acknowledge that it could be so much worse. The coastline is stunning. Easily one of the world’s most dramatic and beautiful and enhanced by the ancient towers that dot the promontories, built over a thousand years ago to watch out for Saracen and Turkish raiders. The houses and hotels lean vertiginously over cliff edges and lemon and olive groves cascade down mountainsides. Positano is the most steep, the oldest, and possibly most picturesque of the seaside towns. We didn’t get off the bus in Positano but it is easy to admire from the road. We spent some time looking around Amalfi and particularly at the cathedral, which is very grand for such a small place – this is because Amalfi was once a maritime hub, so powerful it minted its own coins. It was devastated by a tsunami and plague centuries ago but signs of its past wealth remain. In all the towns along the coast beaches are divided into sections. The largest is for the people who rent loungers for the day and a much smaller part is sectioned off for people who just want to lay a towel down. I find this process offensive – beaches should be for everybody, not a select few, but at least in Amalfi people can put their towels down even between the loungers if there’s space. Admittedly Luke and I didn’t swim at any of the beaches. Apart from the beaches consisting of boiling hot grey pebbles or grit, it is hard to enjoy a beach when there are only two of you. There’s no way we’d leave our bags unattended which means only one of us could get in the water at a time. Fortunately Luke did some research and found that were at least three hotels in Sorrento that would let non guests use their pools for a fee. We found the Hotel Central was cheapest and enjoyed several cocktails and a peaceful swim in their small and quiet pool. Happy days! Luke loves the blue drinks! Also check out the little awning on the beach chairs here! You’ve probably all seen this before but I thought it was nifty. More useful if the chair is actually in the sun but you get the idea. So, we spent one of our days in Sorrento travelling the length of the coast, then our last full day saw us head back to Amalfi, again on the 6:30am bus, to catch the next bus to Ravello. Obviously the next Ravello bus departed just as our bus pulled in (because Italy) so we waited for half an hour then managed to grab a seat. The ride up to Ravello is perhaps less hair-raising than the drive along the cliffs but the road is even narrower in places (at one point it is only one car wide) and the hairpin bends are even more tight. We had breakfast and a wander around Ravello, looking at the Cymbrone Gardens (where parts of Wonderwoman were filmed) and admiring the views of the hills from higher up before heading back to the bus. There was a huge crowd waiting to catch the bus back and Luke made it on before the bus driver cut everyone off. I called out ‘my husband!’ and pointed to Luke and the driver kindly let me board last. This meant I had to sit right next to the bus door with my back pressed against the front window and leaning against it so the driver could see his mirrors. Going through a tunnel backwards in a bus. It was kind of fun in a white-knuckled way and an older lady in the front seat kept smiling and grimacing understandingly at me when we sped up or turned a tight bend. When people got up to get off towards the end of the route everyone was very courteous about making space and letting older people sit down, as well as letting the driver know what was going on at the back door of the bus. By the time we got back to Amalfi to catch our last bus to Sorrento there was a huuuuuge group of people waiting in the bus bay and so I went off to investigate other options and we ended up deciding to pay an extra ten euro to buy a seat on the private ‘city explorer’ bus (you know those red ones you see in major cities) that only sold enough tickets to fill the seats. No standing room and better aircon. Totally worth it! Catching the buses along the Amalfi Coast is quite an experience and can be exhausting. There are big scrums, people push and shove a bit and it’s frustrating if you don’t know precisely where the bus stop is. Staying in Sorrento worked out well as we were at the beginning of the line and therefore always got a seat in the mornings – important when the ride is nearly two hours long. If you’re thinking of visiting the area and catching buses my advice would be to go out of season. Of course if you enjoy combat sports and the smell of sweaty strangers and bus exhaust fumes then by all means go in Summer! The driver who let me ride shotgun. He looks so relaxed! Perfectly suited to a full size bus.